Le Max2 Script : Register now for LeEco Le Max 2 Superphone sale on 28th June 2 PM. 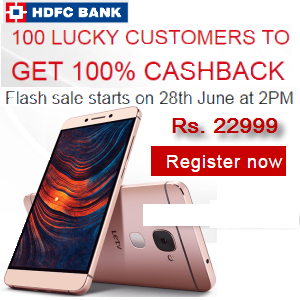 HDFC card users can get 10% cashback max Rs. 1200. Also 100 Lucky customers can get 100% cashback. The maximum cashback permitted/allowed on a card during the Offer Period is Rs.1200. Cashback to be credited to customer account within 60 days. 2. Redeemable LeCode will be sent to you via SMS on your mobile number from your order within 2 weeks of purchase. Download Auto Clicker App from Play Store. Another app named RepetiTouch can do the work more faster ? Note: Your phone must be rooted to use this app. Set the area for clicking using Auto clicker app. It will automatically starts clicking on that area where you specify it to click for Add to Cart button. Note: Add to Cart button will appear on Product Page for LeEco Le 2. So record your click even using RepetiTouch app on Product Page. If you are HDFC Bank Customer then here is the good news for you. You can buy this amazing smartphone at Free. So simply use HDFC Debit or Credit card while doing online payment and get 100% Cashback on Letv Le Max2. Click Here to Flash Sale Timer Page. A window will appear from bottom. Press enter button on keyboard to run this script 5 minutes before the sale. This script will starts automatically clicking on Add to Cart button every 10 milliseconds which is not possible by normal mouse click. Finally your Le 2 will be added to your cart and you can proceed to your order by paying through Credit / Debit card, Net Banking, Cash on Delivery or Gift card. Finally your Le 2 will be added to your cart and you can proceed to placing your order by paying through Credit / Debit card, Net Banking, Cash on Delivery or Gift card. Yes Cash On Delivery is available. Use the latest chrome browser for best result. Use the fastest and stable internet connection available to you. Will it work on every sale? May Be… Because Flipkart will change the tokens on every sale. So, I will update the above code on every sale here. So, Please Bookmark this page and visit my blog before every sale. As LeEco or Letv is a chinese company you will be worried about warranty and after sale support. But they have more than 550 Service center in India.24*7 Call support and freepickup and dropoff service. *This offer is only available to residents of India of the age of 18 years or over. This offer cannot be clubbed with other sales, promotions, discounts, coupons and/or promotions offered by LeEco. This offer is valid till stocks last and the devices will be available for purchase on the Website (optional: insert link) during such period as is communicated to you from time to time through emails/other notifications. Only one device is permitted per customer under this offer. LeEco reserves the absolute right to modify or withdraw this offer at any time and its decision shall be final and binding. The Le Max2 will make all your journeys something to look for ward too. It comes with LeEco’s unique CDLA technology which will renew the way you experience your favourite songs. It sports a powerful Qualcomm Snapdragon 820 Kryo processor and a charming 14.47-cm, WQHD display, so you can play games like Mortal Kombat X without experiencing lag while keep an eye onn youir social media updates too. When you listen to songs on standard smartphones through their 3.5-mm audio jacks, there’s a great deal of loss in data, therefore a loss in clarity. Le Max2’s innovative CDLA (Continual Digital Lossless Audio) technology reduces data loss drastically for crystal-clear, near-FLAC-quality audio. Powered by a 2.15-GHz, Qualcomm Snapdragon 820 Kryo processor and 4 GB of RAM, there’s no doubting the Le Max2’s impressive processing capabilities. Custom-built cores, that are different from each other, work together to ensure that you don’t experience glitches even when you run multiple apps and shift from one to the other often. The processor enhances graphics processing, power efficiency and computing capacity by up to 40%. Not only are the processing capabilities of this smartphone a force to be reckoned with, its energy efficiency is remarkable too. Thanks to the 14nm manufacturing process, LeEco has further lessened power consumption. The Le Max2’s 14.47-cm, WQHD display produces images at a resolution of 2560×1440 pixels, which is four times better than standard, 720p-quality screens. So, not only is it grand in size, it’s rich in quality too. This smartphone has PPI of 515 and it can reproduce 95% of the colour gamut according to the NTSC standard. So, the magic of films series like Lord of the Rings or Harry Potter will come to life on this screen in sharp detail. LeEco refined Sony’s IMX230 camera sensor after more than 540 days of calibration to ensure that the Le Max2’s sophisticated 21-MP rear camera captures professional-level photos. Even if you try to photograph something at night while being seated in a car, the optical image stabilization and supplementary lighting features will ensure that you get clear, blur-free images. Whether you’re shopping or partying, you can use the 8-MP front camera to capture rich selfies with your buddies when y’all are out and about. An ultrasonic sound is produced when you put your finger on the sensor which accurately and quickly identifies fingerprints. So, you and only you can access the personal details of this smartphone. A type-C connector and LeEco’s Quick Charge 2.0 technology ensure that the Le Max2 gets charged in a jiffy. Dynamic Voltage Scaling technology dynamically regulates voltage during charges to ensure optimal, efficient charging. You can use two 4G SIMs with this smartphone to separate your personal life from your professional life. The Le Max2 supports HD voice calls, so all your call conversations will be clear. MIMO (Multiple In Multiple Out) technology drastically enhances the Wi-Fi connection speed. So, you can browse the Web or download content seamlessly even when you’re considerably far away from the router. This smartphone’s full-metal unibody design adds a bold elegant to it, making it a sight to behold. It weighs just 185 grams and it’s 7.99-mm thin, so you can slide it right into your pocket once you’re done with calls. With the Le Max2, you can watch popular, blockbuster films on Levidi (ErosNow Movies-on-demand) or enjoy live TV with YuppTV. The Android Marshmellow (v6.0) OS makes for a highly responsive user interface. It enhances this smartphone’s power management capabilities too. Thanks to 32 GB of internal memory, you can store some of your favourite films, songs, games and apps on the Le Max2.